Discover new keys to solving analytical problems using the Latest sample preparation methods Commonly viewed of as a routine task rather than as an integral component in the analytical process, sample preparation has long been undervalued as a science and underdeveloped as a technology. In an effort to reverse this trend, Handbook of Sample Preparation shows why sample preparation deserves closer scientific scrutiny, and makes a compelling case for colleges and professional laboratories to devote more resources to promote the benefits of its correct application. 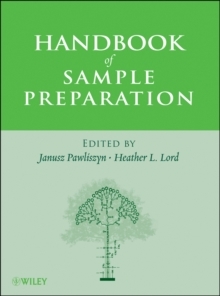 Handbook of Sample Preparation includes: * A solid overview of standard sampling methodologies and their analytical capabilities * An introduction of non-traditional sampling technologies, which address the need for solvent-free alternatives, automation, and miniaturization * A discussion of the analytical shift toward performing sampling on-site, rather than in the laboratory * An examination of various extraction technologies and their applications for different types of matrices * A look at how to take advantage of new sampling strategies to streamline laboratory procedures, reduce research costs, and increase overall productivity An excellent primer on the fundamentals of extraction as well as a sound guide on the latest technological upgrades influencing current sampling techniques, this versatile text serves as an important and accessible tool for both students and seasoned practitioners as they seek new avenues for improving the accuracy of their analyses.